This post is part of a brief series on Paul Draper’s Plantinga Lecture “God and Evil: A Philosophical Inquiry”. Part one introduced us to the basic structure of Draper’s argument and the analogy he uses to illustrate that structure. In this part, we’ll start to consider Draper’s defence of the argument. As noted last time, the lecture is really only a preview of his forthcoming book and so does not offer anything like a full defence of the relevant points. I’ll just look at his defence of the first premise in this post. In the philosophy of science, simplicity is typically assumed to be an explanatory virtue. An explanation is generally thought to be better than a rival if it is simpler. For Draper (and, indeed, others such as Swinburne) simplicity seems to affect the prior probability (or intrinsic) probability of a hypothesis. While that is all well and good, there is a problem. There are a number of different ways of conceiving of theoretical simplicity. Perhaps the most well-known states that simplicity is a function of the number of hypotheses or axioms that must be presupposed in order to accept an explanation. This can be reformulated to have specifically ontological pretensions by stating that it relates to the number of ontological entities that must be presupposed. Another example would be that of Richard Swinburne. 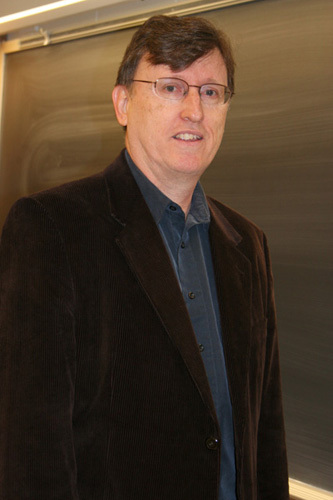 He offers a definition according to which a hypothesis is simpler if it postulates infinite as opposed to finite quantities. Draper is aware of the dispute in the literature and tries to skirt it by offering yet another approach to the topic (thereby, irony of ironies, adding to the complexity of simplicity). He maintains that one hypothesis is simpler than another if it meets two conditions (i) it is more modest than the other and (ii) it has greater internal consistency than the other. He illustrates what he means by referring back to his original example of Poisson’s spot (see part one for details). He asks us to imagine that in addition to wave-ism and particle-ism, there is a third theory on the nature of light called “particle-ism plus”. This theory claims that there are light particles but that they are carried by waves. The interesting thing is that particle-ism plus is consistent with the presence of Poisson’s spot. So there doesn’t seem to be any reason to prefer wave-ism over it, at least by reference to that particular datum. But there is reason to prefer wave-ism with respect to simplicity. Why? Well, because P-plus is clearly less modest than either particle-ism or wave-ism. It makes more specific claims about the nature of the world than either of the other theories. It thereby increases the chance of error. Furthermore, it has less internal coherence than the other theories. It only manages to account for the datum of Poisson’s spot by making considerable moves away from particle-ism towards wave-ism. 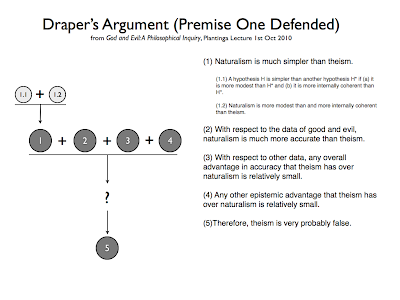 Returning to Draper’s argument, his claim is that theism is much like P-plus. For starters, theism, like P-plus, is a more specific version of another theory (in this case supernaturalism). And because it is more specific, it displays less modesty than supernaturalism (or, indeed, naturalism). Furthermore, while the specific claim of theism (i.e. there is an omni-propertied personal being) is not actively inconsistent with supernaturalism, it is certainly not a natural entailment or product of that more general theory. (1.1) A hypothesis H is simpler than a hypothesis H* if it is (a) more modest than H* and (b) more internally coherent than H*. (1.2) Naturalism is more modest and displays more internal coherence than theism. (1) Therefore, Naturalism is much simpler than theism. Before moving on to consider Draper’s defence of premise (2) I want to say a couple of quick words about his defence of premise (1). First, I’m not entirely convinced that Draper’s account of simplicity is correct, or whether its good to add another account to the pile, but I can let that slide and try to assess it on it own merits. Second, I’m not sure the analogy Draper tries to make stacks up here. My feeling is that P-plus is less probable because it seems to have been so obviously introduced as an ad hoc saviour for particle-ism. In other words, it looks like a revision of particle-ism that is less modest because it is adopted in the face of unwelcome facts. This doesn’t seem to me to be at all like theism, which does not (yet) suffer from such ad hocery. Theism may suffer from immodest ad hocery when it is revised in the face of unwelcome facts, but since simplicity has to do with a priori plausibility this consideration seems not to apply here. 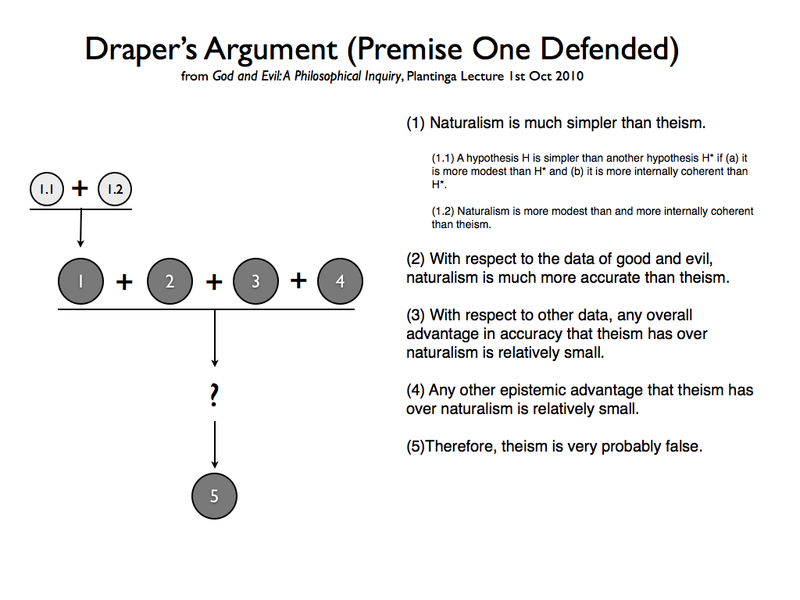 Now my reaction might just be an accidental by-product of how Draper presents his case: he discusses the simplicity of P-plus after having already discussed Poisson’s spot, and discusses the simplicity of theism prior to considering the problem of evil. If I abstracted away this sequence, the simplicity point might hold up. Third, there is something a little stretched about the analogy Draper tries to draw between incoherence/inconsistency in the case of P-plus and incoherence/inconsistency in the case of theism. While it seems obvious enough that P-plus is some sort of an uncomfortable alliance between wave-ism and particle-ism, it seems less obvious that there is an uncomfortable alliance going on in the case of theism and supernaturalism. If theists had to make some concessions to the priority of the physical in formulating their hypothesis then maybe the analogy would hold up. Furthermore, in his discussion of this point it seems like Draper is only saying that theism is not directly entailed by naturalism, which seems to me to be no different from his observation that theism is immodest when compared to supernaturalism and theism. Finally, it occurs to me (although this is irrelevant to Draper’s argument) that there might be more specific forms of naturalism that could suffer from immodesty and incoherence (indeed, the more sophisticated forms of naturalism probably do). This is something to be borne in mind. While a vague and general form of naturalism might do well vis-a-vis theism, a more specific form may not. Anyway, that's enough for now. In the next part I'll look at Draper's defence of (2). I always find presentations of explanatory virtues intriguing. 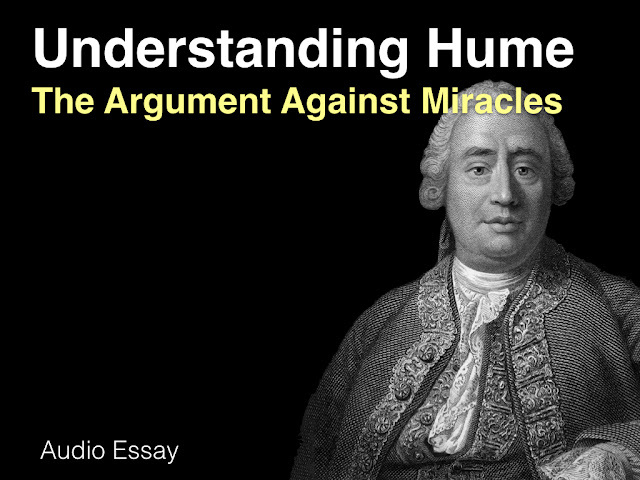 I'm glad you wrote the post series on Dawes's Theism and Explanation and I hope that in the future you will also tackle Kolmogorov complexity (perhaps in your series on miracles and Bayes theorem). Meanwhile, to what type of simplicity do you subscribe to? Sorry to disappoint, but I won't be covering Kolmogorov complexity in my miracles series. Hasn't come up in any of the materials I've read so far. But I might cover it some other time. Re: simplicity. I haven't got any deep, well-thought views on the matter, but I do find Elliott Sober's analysis rather illuminating. I think simplicity basically involves the minimisation of some property contained in competing explanations. The problem is that there are often many properties that could be minimised. Sober gives the example of psychological egoism to illustrate his point. Is the claim that human beings are motivated solely by self-interest simpler than other theories of motivation? In one sense yes because it proposes that there is only one type of motivation whereas other theories propose more. But in another sense no, because egoist theories force us to attribute more complex causal beliefs to agents (see here for more). Given the problem of multiple properties for minimisation, I feel like any explanation that claims the virtue of simplicity should state explicitly what is being minimised and offer some kind of reason why this property should be minimised rather than any other. I reckon that's about the best we can hope for. Given this, I'm inclined to downplay my first objection to Draper. While the two cases are not that analogous, I do think Draper's overall scheme still seems to work. Theism is still a more specific theory than Supernaturalism or Naturalism (as he defines them), and it does appear to me that a priori I would be more inclined to wager on less specific theories. I tend to think of theism as infinitely complex due to the infinity of mental content that God supposedly has. And I tend to think of naturalism as uniformity, which is equivalent to saying it can be described simply (small Kolmogorov complexity). So by my own reckoning, naturalism is indeed (infinitely) simpler.